Pradhan Mantri Gram Sadak Yojana (PMGSY) was launched at the fag end of 2000-01. 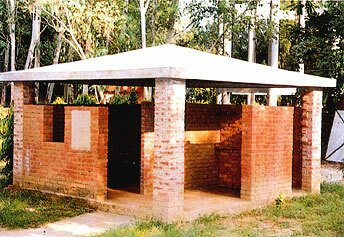 The primary objective of this Yojana is to provide connectivity, by way of all weather road (with necessary culverts and cross drainage structures which is operable throughout the year), to the unconnected habitations in the rural areas, in such a way that habitations with a population of 1000 persons and above are covered in 3 years (2000-03) and all unconnected habitations with a population of 500 persons and above by the end of 10th Plan period (2007). In respect of hill areas, the objective would be to connect habitations with a population of 250 persons and above. The PMGSY will permit the upgradation of the existing roads in those districts where all the habitations of the above population size have been provided all weather road connectivity. However, the spirit and objective is to provide good all weather road connectivity to the unconnected habitations and as such it is required to be ensured that the provision of new connectivity is given precedence in keeping with the objectives of the programme. New connectivity implies construction of roads from the earthwork stage to the desired specifications (Rural Roads Manual – IRC SP: 20:2002) and would, therefore, invariably involve some earth work. Existing gravel or WBM roads will not qualify to be treated as works of new connectivity even where they involve some earth work by way of widening of the carriage way or road formation. Work on a road which only has earthwork (and not a gravel road) will be treated as a case of new connectivity. The primary focus of the PMGSY is to provide all weather road connectivity to the unconnected habitations and all weather road is one which is negotiable during all weathers. This implies that the road bed is drained effectively by adequate cross drainage structures such as culverts, minor bridges and cause ways. The pavement should be negotiable during all weathers but this does not necessarily imply that it should be paved or surfaced or black topped. The unit of this programme is a habitation and not a revenue village or a Panchayat. A habitation is a cluster of population living in a area the location of which does not change over time. The PMGSY shall cover only the rural roads. Urban roads are excluded from the purview of this programme. Even in the rural areas, PMGSY covers only the rural roads i.e. roads that were formerly classified as “Other District Roads” (ODR) ad “Village Roads” (VR). Other District Roads are roads serving rural areas of production and providing them with outlet to market centers, block headquarters etc. Major District Roads viz. State High Ways, National High Ways cannot be covered under PMGSY even if they happen to be in rural areas. This implies to new connectivity roads as well as upgradation works. The PMGSY envisages only single road connectivity to be provided. If a habitation is already connected to another connected habitations by way of all weather roads, then no further work can be taken up under the PMGSY at that habitation. For and on behalf of the Paschim Medinipur Zilla Parishad, the Executive Engineer, Paschim Medinipur Zilla Parishad, invites e-procured percentage rate tenders for Improvement of road from Bankim Das house to Rasbihari Mohakur House within Dantan-II Panchayat Samity area in the District of Paschim edinipur.